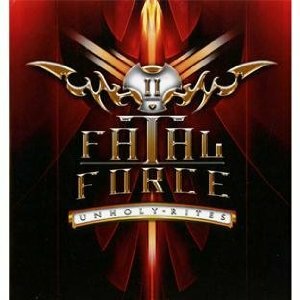 Fatal Force was formed in 2005 by Fate guitarist Torben Enevoldsen. The band's first album was released in 2006, but scheduling delays (a sad reality of being involved in more than one band and also doing solo work) meant that the second album wasnt recorded till the end of 2010. Now it's finally been produced its just been released. The music feels like 80s heavy metal mixed with melodic rock. It's clearly guitar driven and the guitars keep things heavy, but the vocals and well written tunes stop it being too heavy and make it something that melodic rock fans will certainly enjoy. It's a good solid album, with all the tracks being of a very high standard. An album definitely worth checking out, particularly for fans of bands including Fate, State of rock, Dokken and more. "Unholy rites" is out now via AFM records.